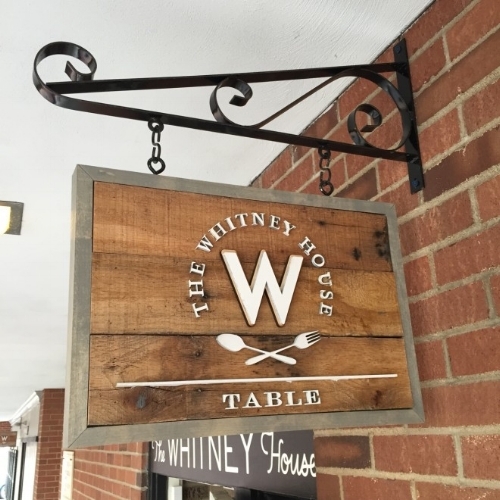 In case you missed it, the Whitney House has a new chef! At the beginning of 2018, chef Max Avon moved on to Lindey’s in German Village. Let’s get to know the new executive chef, Chris Caslow! Nick: Are you from Worthington originally? Chris: I’m from Worthington and gradated from Thomas Worthington in 2008. Nick: How did you start your culinary career? Chris: My first job was at Bon Vie at Easton through the externship program at Linworth. When I had started I was all of 18 years old and the chef there wasn’t exactly happy to have some kid there, free labor or not. For six months I worked my way through the entire restaurant – at the end of the six months they hired me on. Pantry, oven, prep – by the time I left I was supervisor. It was a four-and-a-half year process of working my way up to supervisor and a leader. I spent four-and-a-half years there, the left to go to the Refectory. I spent two years there; when I heard Ian Brown was opening the Whitney House I reached out. It was through the externship program at Linworth where I had first met Ian. I’ve been here since day one. I was sous chef for first three years, and when Max went back to Lindey’s, I climbed up the ladder. Going to the Refectory was more of a culinary school of sorts – learning how to cook from someone who was amazing. It’s something I will never get back. That’s my philosophy – working your way up the ladder. It’s more rewarding to work your way up. It’s 12 years and I got the title I wanted. We’ve put a lot of work into the Whitney House and we’re working on our fourth year now and not slowing down. Nick: Is there anything new coming on the menu? Chris: We have tinkered with a few things on the menu. We’re going to be working on a spring menu for the end of this month. It’s still in progress. We are messing with some of the dishes that have not changed. 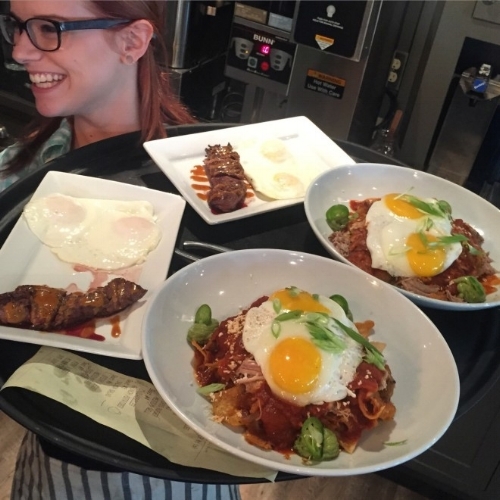 Our chilaquiles are getting a nice facelift. Our ramen is getting an overhaul as well. It’ll be a nice of change of pace. Nick: What’s your favorite dish to cook at the restaurant? Chris: It would be toss up between one of our two weekly specials – the Tuesday Mom’s Stroganoff and the Saturday short rib. Both of those I can get down on any time. Nick: Do you cook at home? Chris: I try, but I do so much here. We just bought a condo on Hard Road and finally got the kitchen unpacked. I just made a simple egg sandwich at home. It was fun to cook and take my time and enjoy it. Nick: What’s your go-to drink? Chris: I’ve never really been a fan of cocktails – they’re too sweet to my liking. Usually my go-to is a Bud Light or an IPA of sorts. Nick: Any other favorite spots around the city? Chris: As much as I don’t like cooking breakfast, I love eating it if someone else is making it for me. It’s my favorite type of food to eat. I like either First Watch or Sunny Street Cafe for breakfast. I love Northstar Cafe, too. And we do 101 Beer Kitchen every once in a while. We went to G. Michael’s for Valentine’s Day. A chef doesn’t get out much! Nick: What’s in store for the Whitney House next? Chris: When the new Han Solo movie comes out [May 25], there will be some kind of late-night dinner going on that night, some type of ramen or three-course dinner. 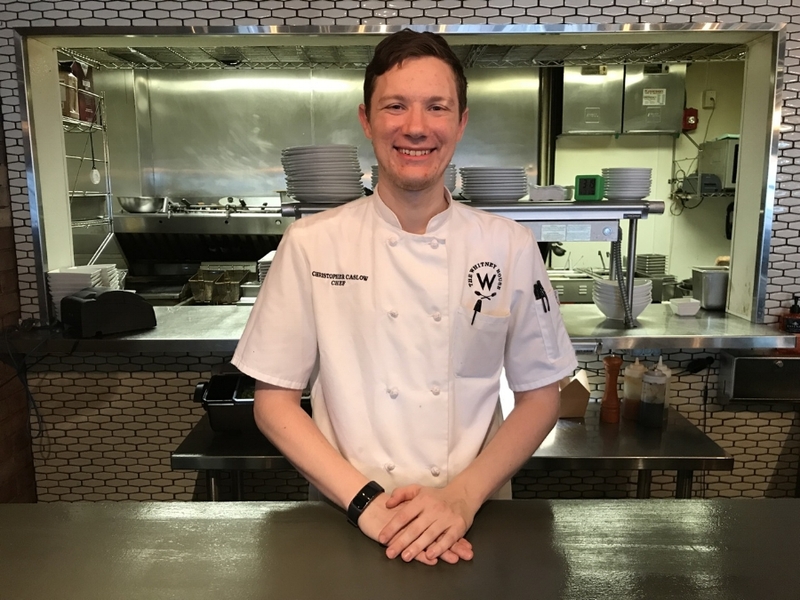 Meet Chef Chris and the whole culinary team for lunch, dinner, and weekend brunch at the Whitney House! Visit the Market, Go Green, Test Drive an Electric Car – All This Saturday!